Grant McPhee, director of the quite excellent feature length documentary Big Gold Dream, tells us a little about the film’s background. 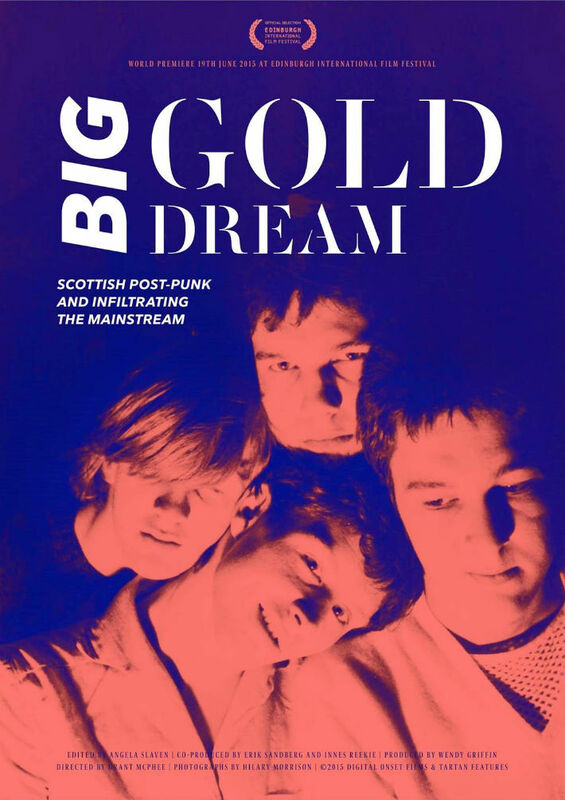 A real labour of love, BGD explores and examines the Scottish post punk faction – Fast Product and Postcard Records, primarily. Co-produced with Grant’s collective of cohorts: Innes Reekie, Erik Sandberg, Wendy Griffin and Angela Slaven, their Infiltrating The Mainstream mantra says it all. Big Gold Dream came about as it was a film I wanted to see myself. Nobody seemed to be making it so I thought I would. The fact I didn’t really know how to didn’t seem a problem – at the time anyway. This was a little before all the other record label documentaries came out – Rough Trade, Good Vibrations etc. I think the only other similar film that was around was Made In Sheffield which was definitely an inspiration. I just wanted to see this, it didn’t look like it was going to be made so I thought I’d have a go. I’d met Malcolm Ross early on who introduced me to a few bands I hadn’t heard before, namely The Scars. I’d known Fast Product as they had released Joy Division on Earcom and Being Boiled which I liked but I had no idea they were based in Edinburgh, which really intrigued me. So the original premise of it being about Postcard quickly changed to being about Fast Product. Meeting Innes Reekie, a journalist and Fast associate also helped re-enforce the direction change. The production was incredibly slow and tough, mainly due to it being self-funded but meeting co-producers Erik Sandberg, Innes Reekie, Wendy Griffin and especially editor Angela Slaven helped enormously. It was a mixture of naivety and enthusiasm on my part but their help was incredible. We wanted to tell the story as faithfully as possible. It’s never been the intention to make an encyclopaedic history of Scottish punk music, we just wanted to tell our story in the words of those involved. We thought getting the personalities of those involved across was more important than exact chronological details as that’s what made the label – and the records appealing. We also wanted to add some humour which seemed to be frowned upon when discussing indie and post-punk labels. Small anecdotes are far more appealing than the subtle differences between pre and post EMI Gang of Four Fast Product records. We thought getting the personalities across was more important than exact chronological details… We also wanted to add some humour which seemed to be frowned upon when discussing indie and post-punk labels. Fast still does not seem to gain the respect it deserves. I think part of the reason is because the whole Fast story is less easily digestible than Postcard or Factory, and as the city of origin for the bands is more diverse it’s more difficult to pinpoint a singular theme or style which is always important for record labels. I think overall it’s more rewarding to delve into Fast however, and that also includes what I think is the main reason it’s still overlooked – that it’s relatively difficult to find the music. Fast has never had a proper retrospective, other than The First year Plan and part of the appeal is their philosophy as a whole – packaging and content and that’s not something that translates to YouTube, iTunes and Spotify. You have to go out and buy the records and appreciate them as a whole. I think what has surprised most people is the full breadth of the Fast story. It wasn’t just the 12 releases on Fast Product, it was up to and beyond The Human League’s Dare and how inter-twinned all the bands and members were. The Fire Engines Big Gold Dream single used the Human League Dare album’s Linn Drum Machine. Jo Callis was in The Rezillos, Boots For Dancing and Human League and so on. By the end I think you understand why Sheffield, Edinburgh and London are the cities mentioned on the front cover of the first Heaven 17 album. There should be a DVD release of Big Gold Dream and more screenings in 2016 too. If this type of thing floats your boat then have a read and a watch of Glasgow Music Videos – a feature on an event RR’s Andy curated for the Glasgow Short Film Festival many moons ago now. It might be of interest.